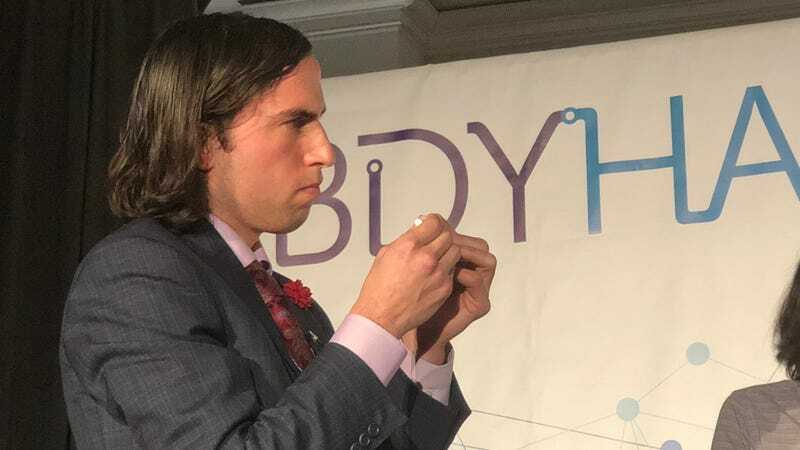 Aaron Traywick, the theatrical CEO of a regulation-averse biotech company called Ascendance Biomedical who recently injected himself with an untested herpes treatment on stage at a conference in Texas, is now at the center of some major drama in the biohacking community. Ascendance has a CEO but otherwise operates as a loose consortium of many biohackers and transhumanist types who work with the company primarily in exchange for equity and research funding. Late Sunday night, some of those people associated with Ascendance gathered in an apartment in Florida to discuss the situation in a Facebook livestream. Participating in the coup was Licina; his lab partner, Justin Atkin; Andreas Stuermer, who developed the herpes treatment and had originally planned to test it on himself; and Tristan Roberts, a computer programmer who had volunteered for an earlier experiment and ran the digital side of Ascendance. They would no longer be working with Ascendance, they announced. Traywick, they said, had put pressure on them to cut corners on science in order to make arbitrary deadlines set up to reveal new therapies to the press. Traywick’s stage stunt in early February in Texas, in which Traywick claimed the company may have created a vaccine and cure for herpes, attracted much ire from the biohacking community. Some people said such stunts and unsupported claims gave the DIY science community a bad name. Ascendance says it is working to cure cancer, herpes, HIV, and aging. It relies on volunteers to test novel therapies on themselves, a loophole that puts its activities outside of the regulation of the Food and Drug Administration. In October, the company encouraged Roberts to inject himself with an untested gene therapy that Ascendance claimed was capable of curing his HIV. That test was live-streamed on Facebook. “These stunts make old-school biohackers/self-experimenters (like me) look like ignorant fools,” one biohacker wrote on Facebook, in reaction to a story about the company published by Gizmodo. Roberts, who earlier told me he now feels he was foolish to undergo the initial gene therapy offered by Ascendance, told the livestream audience that they wanted to “eliminate” Traywick from the biohacking community before he “hurts people.” Traywick had irresponsibly inflated the company’s advancements and thrown around the “c-word,” cure, he said. Roberts also claimed on the livestream that Traywick was “defrauding investors,” though the specifics of how he may have done so are unclear, and Traywick did not directly respond to a request for comment on that aspect of the skirmish. This does not, however, seem like it will mark the end of experimental therapies developed outside the purview of regulatory agencies like the FDA, which has warned about the dangers of self-experimentation. The work will continue outside of Ascendance, Licina said. When it’s ready, they may even go ahead with plans to test a second version of the HIV therapy on Roberts.